Nothing says “bah-humbug” more than identity theft during the holiday season. Unfortunately, December is the time of year when Americans are most vulnerable to having their personal information stolen. In honor of National Identity Theft Prevention and Awareness Month, here are several tips for protecting your privacy. Your trash is a gift that keeps on giving—to identity thieves. Residential garbage cans and recycling bins offer them a goldmine of sensitive personal and financial information. 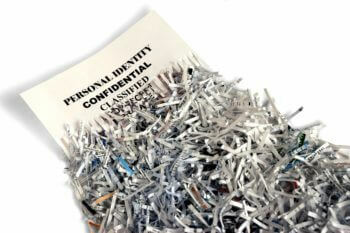 Use a drive-up and drop-off shredding service to destroy your family’s unwanted personal documents. Your documents are shredded in a matter of minutes while you watch, and you’re issued a Certificate of Destruction for your records. December is when mail theft crimes reach their peak. Criminals use the high-volume shipping season as an opportunity to steal gift envelopes, holiday credit card offers, and packages from doorsteps. A lockable mailbox makes it harder for thieves to steal your mail. Otherwise, know your mail delivery schedule and collect letters as soon as they arrive. Never mail bill payments and greeting cards with checks from your mailbox; take them to your local post office instead. Promptly collect shipped packages from your porch. If you’re not going to be home when your package arrives, instruct your shipping provider to leave it at your back door or with a neighbor. The holiday season can be hectic, so taking a break from the hustle and bustle to sip a cup of coffee at your favorite café is a relaxing diversion. But avoid using its free WiFi network. Most free, public WiFi hotspots are unencrypted, allowing cybercriminals to spy on your online activity and intercept your sensitive information. It’s best to wait until you get home to surf the web, check your email, and shop online. If you must connect to a public WiFi network, make sure your device has a virtual private network (VPN) installed. It’s easy to lose your shopping receipts during the holidays; they often get stuffed in the bottoms of bags or end up in the trash. Try to keep track of them so you can compare them to your credit card statements and online purchase histories, and don’t fall victim to unauthorized charges. Good credit card habits often get forgotten during the holidays. Since identity theft spikes in December, monitor your credit this month with a watchful eye. Each of the three credit bureaus—Equifax, Experian, and TransUnion—offer one free credit report each year. Get yours before the year ends. Don’t let identity theft ruin your holiday cheer. Follow these tips to protect your privacy.